As a bitter cold February wind swept across the plains of North Dakota, and the Water Defenders at Standing Stone stood their ground, Indian youth participating in MIGIZI’s Green Jobs Pathway Project worked feverishly hundreds of miles away to complete a solar-powered water heater that would help to sustain the camp and the Defenders through the long winter days and nights ahead. Jon Eagle, Sr., a horse rancher from the Standing Rock Sioux Reservation, and a participant in the Dakota 38 Ride, provided horses that Defenders relied on at the camp. Jon also uses horses for equine therapy training, where he teaches other people how to facilitate equine-based therapy remedies. He had put out a national call for help in designing and building a heater that could be used to prevent the water in his horse troughs from freezing and his horses from becoming dehydrated during the frigid winter days. John Hunter, Coordinator of MIGIZI’s Green Jobs Pathway, responded to the call and offered the help of MIGIZI’s Green Jobs Pathway youth who were joined by an Instructor in the Solar Energy Program at Century College. 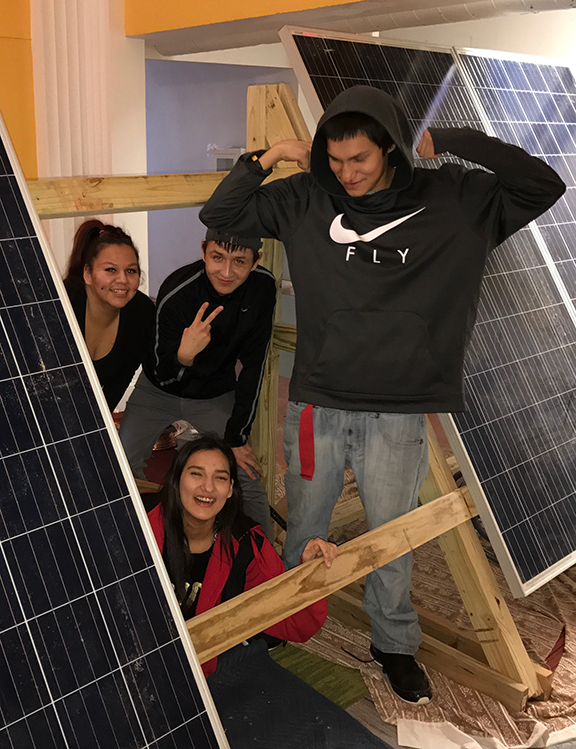 In late February 2017, John and the youth completed the first of its kind solar powered water heater and traveled to install it at Standing Rock, where they were welcomed by community members and awarded a college credit from Sitting Bull College for their cutting edge work. This was the first of several projects that youth involved in MIGIZI’s Green Jobs Pathway have under-taken to demonstrate their learning and showcase the benefits of solar, water, and wind renewable energy technologies. This past summer, youth constructed and installed solar panels to light the roof of the Heart of the Beast Puppet Theatre; they built and installed a solar panel at Little Earth to power the outside grounds of the Teen Center; and built a solar-powered weather station for installation on the roof of Nawayee Center School that will enable students to monitor weather patterns as part of their science studies. Throughout time, Native Peoples have been forced to accept decisions that pit our indigenous cultural values of sustainable stewardship of lands and resources against colonialistic economic interests. Numerous examples of this conflict exist from deforestation of Minnesota’s tribal homelands by lumber barons, mining of coal in the sacred mountains on Navajo lands, to the recent oil pipeline being built by Energy Transfer Partners that will surely result in the contamination of the waters of the Missouri River, the primary water source not only for the people of Standing Rock but for the many non-Native communities down river. MIGIZI’s Green Jobs Pathway provides an unprecedented opportunity for Indian young people to learn about, and become proficient in renewable energy technologies that not only embrace indigenous cultural values but also lead to living-wage jobs in Minnesota’s growing green economy. The clean energy sector is, in fact, the fastest growing employment sector in Minnesota, with a growth rate 3.8 percent higher than the state’s job growth rate as a whole (Minnesota Jobs Related to Clean Energy Have Grown More Than 5 Percent, Star Tribune, September 7, 2017). Wages for workers in renewable energy jobs, including solar installation and wind turbine service technologies, range from $20.82/hour to $27.76/hour (MN Department of Employment and Economic Development – DEED Occupations in Demand database). The Green Jobs Pathway targets American Indian youth from 14-24 years of age who are hands-on learners and interested in training for a job or career where they can contribute to environmental sustainability while earning a living wage. 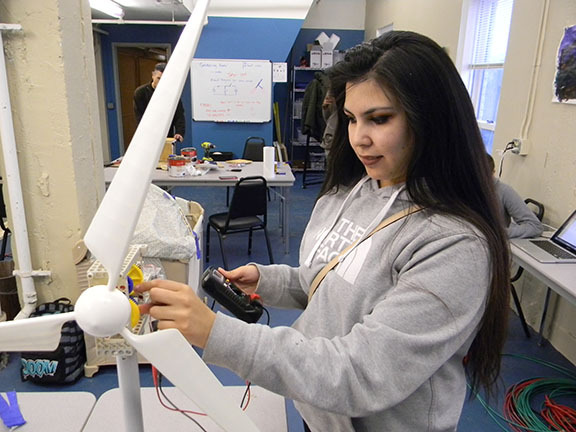 The program includes a paid ten-week Environmental Stewardship Institute during which youth learn the fundamentals of renewable energy technologies and have an opportunity to acquire industry-recognized certificates. 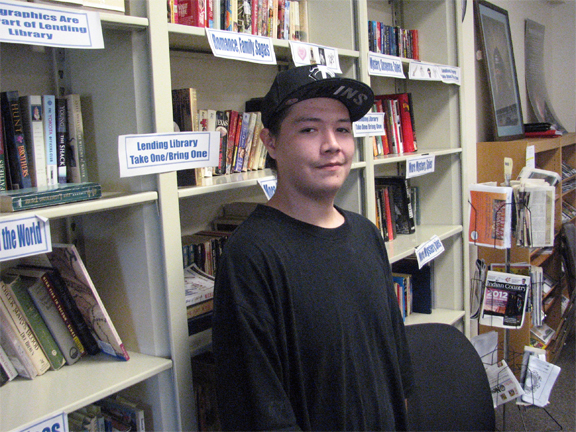 Youth also receive academic support so that they can remain on track or get back on track for high school graduation, or work toward a General Equivalency Diploma (GED). As youth earn a diploma or acquire a GED, they are provided with transitional support to help them navigate post-secondary educational opportunities. The program serves three cohorts of youth each year; including high school students (summer), youth who left school prior to high graduation (fall), and youth who have a high school diploma or GED but are not in college or working in a living-wage job (winter). 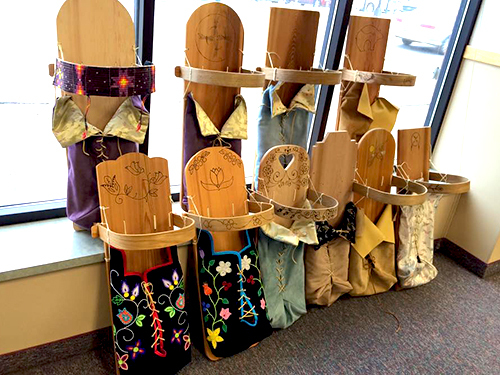 Key partners in the project include Nawayee Center School, MPS Indian Education, AchieveMpls, Center for Earth, Energy and Democracy (CEED), Minneapolis Community and Technical College, Dunwoody College of Technology, and Century College. The Green Jobs Pathway is made possible through support from the Opportunity Reboot Initiative of Youthprise (intermediary for a grant from the Corporation for National and Community Service, Social Innovation Fund), the Northwest Area Foundation, Otto Bremer Trust, and MN Department of Employment and Economic Development (DEED). If you are interested in learning more about the Green Jobs Pathway and the opportunities it has to offer, call Nicole DeCoteau-Vause at 612-721-6631, ext. 202, or email Nicole@migizi.org.